Like many stories of island journeys, the pursuit of high levels of renewable energy in the Pacific involves good planning and skilled navigation to stay safe and on course, and holds the promise of rich rewards. Throughout the Pacific, island communities are embracing ambitious renewable energy targets , many as high as 100% renewables over the next decade or two. This isn’t surprising, given that these islands are already experiencing significant impacts of climate change, and recognise the environmental benefits of reducing or replacing carbon-intensive diesel power generation. There are also sound economic benefits to reducing reliance on expensive diesel fuel, which remains the single largest expense to generate power in these remote locations. The answer to meeting targets, while also reducing carbon emissions and costs, lies in power systems that use only renewable energy. However, transitioning to higher levels of renewable energy in power systems requires confidence that the renewables can provide the energy security, self-sufficiency and system stability required by these remote communities. Renewable energy technologies may pose some challenges for reliability and quality of power supply, but remedies can be found in enabling technologies. In an isolated power system, matching the renewable technologies with the right enabling technologies at the right moment needs detailed planning. As each island community’s renewable energy journey is different, careful strategic planning is needed to choose the right solution, to integrate it in the right way, and to be able to scale it up effectively to meet increasing renewable targets and electricity demands. Stage 1: Planning – In this stage, we explore the status of the current power generation assets, determine what needs to be improved, understand the renewable resource, and investigate the cost of the renewable energy journey and options for funding it. Stage 2: Introduction of renewables – In this stage, we begin by harvesting the ‘low-hanging fruit’ – introducing the renewables that we can without enablers or network upgrades, and without changing the control philosophy. At this stage, the renewables are perceived as mostly load offset, and could reach up to 15–20% of the island’s total energy demand. Few enabling technologies are necessary at this stage. Stage 3: Expansion of renewables and introduction of enablers – As we progress beyond 15 to 20% renewable penetration, we need to stop, review and adjust course if necessary. To progress towards 35% renewable energy contribution to the power system demand, we need to adjust the system’s operating philosophy to integrate large-scale renewables, and introduce the appropriate enabling technologies. 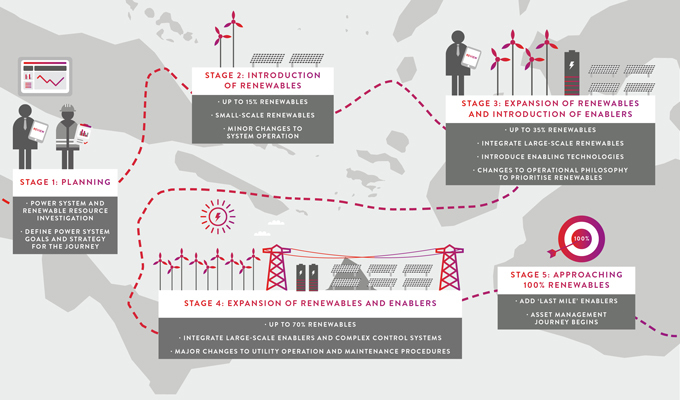 Stage 4: Expansion of renewables and enablers – This stage marks the largest change in how an island power system is operated. As we move beyond 50% renewables, again we should stop, review and adjust course where needed. At this stage, power systems become very complex to operate and maintain as high renewable penetration can only be achieved through a delicate balance of multiple new enabling technologies working in perfect sync. The island community could find itself investing more in enabling technologies than in renewable energy at this stage, but this could result in a higher renewable energy contribution. It is also crucial at this point to consider changes to energy delivery, relationships with customers and to the utility’s procedures, and to building its personnel capabilities. Stage 5: Approaching 100% renewables – As most of the major changes to the power system are introduced in the earlier stages, Stage 5 is about finishing off the journey. The ‘last renewable mile’ is usually the most expensive one, so this last stage is all about identifying enabling technologies and techniques that can bridge the gap between 70–80% and 100% renewable contribution, without significant increases in the cost of electricity. Entura has helped several island communities plan and begin their renewable journeys. One example is the island of Yap in the North Pacific. We’ve been working with the Yap State Public Service Corporation to reduce Yap’s heavy reliance on imported diesel for power generation, and to enable the island to rely as much as possible on indigenous, renewable resources through an integrated high-penetration renewable energy remote area power system (RAPS). After decades of operating on diesel fuel only, the system will soon reach 25% renewable energy contribution. Once completed, the project aims to enable Yap to experience up to 70% instantaneous renewable penetration when conditions allow, and to deliver an annual fuel saving of up to US$500 000. 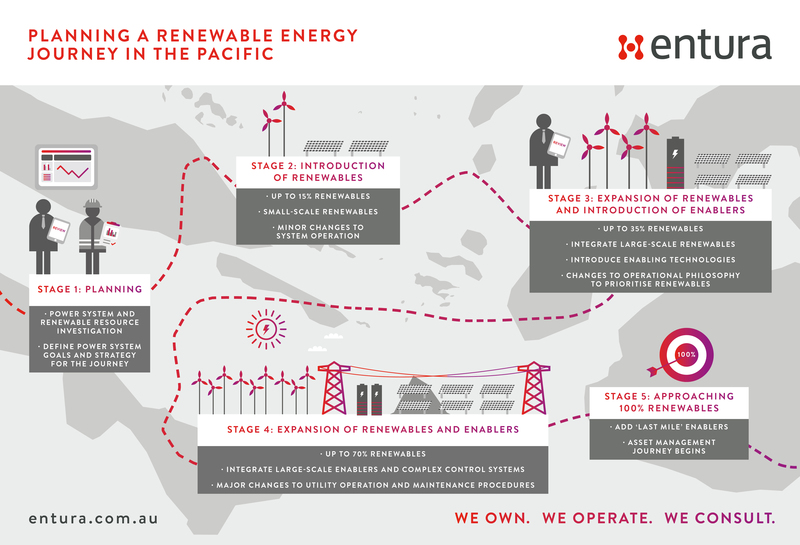 Back in 2014, Entura helped the Yap community plan their renewable journey by embarking on Stage 1. 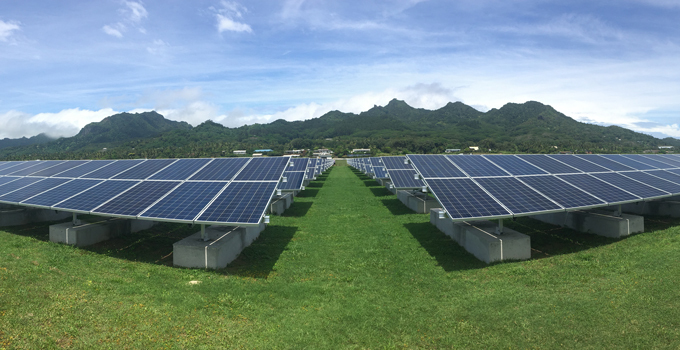 Since then, Entura has helped the Yap utility to reach Stage 2 by integrating small amounts of solar and by building its capability to install and maintain solar arrays. The Yap renewable energy development project is now entering Stage 3, in which a new breed of high-renewable-supporting diesel generators are being installed, major works are being carried out to install three 275 kW cyclone-proof wind turbines, an island-wide solar-controlling communications network for 500 kW distributed solar PV is being rolled out, and a centralised control system is being installed. Once these activities are completed, the Yap power system will be firmly in Stage 3, and ready for future stages in Yap’s renewable journey. The Cook Islands is a group of 15 small islands in the South Pacific, to the north-east of New Zealand. Entura is helping the Cook Islands on its journey to reduce reliance on diesel fuel and achieve greater energy security, self-sufficiency and sustainability through developing renewable power systems on six islands. The country’s goal is to generate electricity from renewable energy sources on all islands by 2020. The islands of Mauke, Mitiaro, Mangaia and Atiu have small average loads of around 100kW each. After careful planning, upgrades to the distribution grid and programs to train and build local capacity, these islands will quickly reach Stage 5 of their journeys, operating at almost 100% renewable energy using solar PV and batteries, with diesel providing backup during longer periods of renewable energy resource deficiency. A fifth island, Aitutaki, is currently at Stage 1, finalising the planning of its renewable journey. It will rapidly jump to Stage 3 as 1 MW of solar PV, a 0.5 MW power battery, new diesel generator and centralised control system start working together to deliver a power system with a renewable contribution of up to 25%. 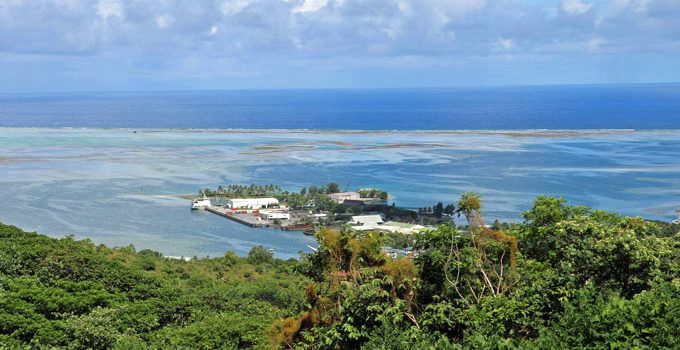 Rarotonga is the largest, main island in the Cook Islands and operates a complex power system requiring meticulous strategic planning. This power system is already at Stage 2, with a renewable contribution surpassing 10% due to the contribution of residential and commercial solar. 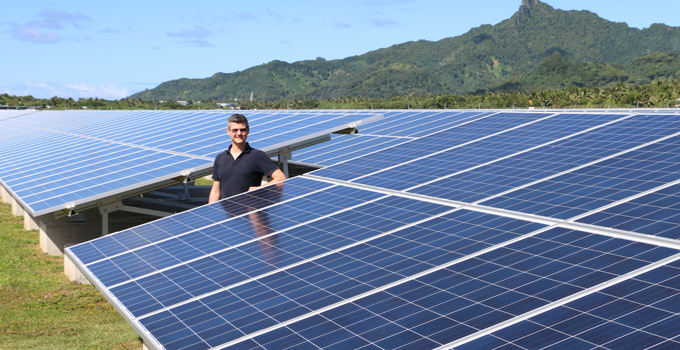 Entura is helping the Rarotongan utility to move towards Stage 3 by introducing an additional 1 MW of solar PV and enabling technologies such as energy storage, which will help the system absorb even more renewable energy. It is often said that the end of one journey is the beginning of another. After a community has reached 100% renewable energy, it needs to continue its journey to maintain that status through proper operation, maintenance and asset management, to secure the system for years to come. This long-term asset management challenge involves attention to both physical and human assets, including capacity building, training and skills development for individuals and organisations. Entura is bringing practical maintenance know-how to island communities such as Yap and the Cook Islands. And, through the Entura clean energy and water institute, we are helping to boost the skills of technicians and managers. By doing so, Entura is offering island communities a guiding hand from the start of the renewable journey right through to its destination, and beyond. If you would like to discuss how Entura can support your renewable energy journey, please contact Silke Schwartz on +61 407 886 872 or James Mason on +61 400 603 650.